Lettie rides most days when not busy with her winemaking and other winery work. Flying Horse Winery is owned and operated by the Smeding Family. Hendrik runs the day to day winery business, Lettie is the winemaker, Hendrik IV keeps an eye on our vineyard, and Bergen works on marketing and sales. The Smeding family has a four generation history of working in agriculture in the Napa Valley. It all started in the 1920’s when Lettie’s Scandinavian grandparents Ivar and Saima Asplund came to the Napa Valley, purchased land, and began farming. Ivar owned and managed prune orchards. He was also active in the grape business, helping with harvests and hauling grapes. Lettie’s mother would often be seen helping her father with the farm. 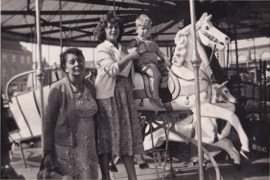 Hendrik with his mother and grandmother on a "Flying Horse" Carousel. Hendrik and Lettie met at U.C. Davis where they both were zoology majors. Their interest in wine was sparked when they attended one of Professor Kunkee’s winemaking classes. From this a seed was sown to make wine, to grow the grapes and to enjoy the fruits of their efforts. The Smedings planted a hillside vineyard on their Napa Valley Ranch. It has beautiful soil. Irrigation water is from their historical Peach Tree Springs that is located near their vineyard. They grow their grapes in an organic manner. Snell Valley Ranch has eagles, hawks, and owls as natural predators for the vineyard. The Smedings hope to increase the grape acreage over the years as there is 500 additional acres that soil studies show to be plantable. The Smeding family has long had a love of horses. They all ride Quarter Horses and Arabians on trail and when working their cattle. Lettie rides most days when not busy with her winemaking and other winery work. 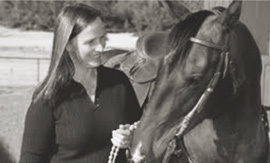 All family members have competed in Endurance Riding. These horses are the real flying horses as they trot and canter cross country.